Primera Technology, a manufacturer of specialty printers, has introduced new industry-grade printer designed to offer pigment inks, fast print speeds and low cost per label. The new LX1000e color label printer is designed for applications requiring extremely durable labels. Primera’s EMEA office Primera Technology Europe managing director Andreas Hoffmann said: “We are excited to add LX1000e to Primera’s complete range of desktop color label printers. Based on Primera’s LX2000e Color Label Printer, the LX1000e is Primera’s entry-level unit using pigment ink. The printer provides lower cost per label compared to all desktop colour inkjet printers currently available near its price. Additionally, the LX1000e offers a print speed of up to 101mm (4”) per second and produces professional-looking labels without affecting print quality. Primera said that printer drivers are included for Windows 7/10, along with Bartender Ultralite and NiceLabel SE Primera Edition Software to format label designs, add barcodes, QR codes, among others. 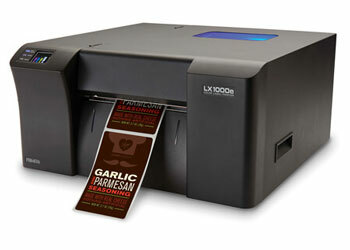 The LX1000e can be used for private labeling, test marketing, pre-press proofing and retail shelf labeling. Applications for the new label printer include product labels for coffee, wine, bakery, confectionary, meat, cheese and hundreds of other specialty and gourmet foods. Image: The new Primera’s LX1000e color label printer. Photo: courtesy of Primera Technology Europe.